The festival is content-wise thus dedicated to thematization of colours in the context of contemporary art. The selected projects, among which many new productions, explore the rich symbolism and expressiveness of colours as well as their role in achieving different visual effects. Finally, colours also serve as a system of labelling and communication; as such they’re not only an important element of art, but of everyday life as well. They often influence the viewer’s perception and their mental state and they frequently function as some kind of landmark for orientation and a source of information. 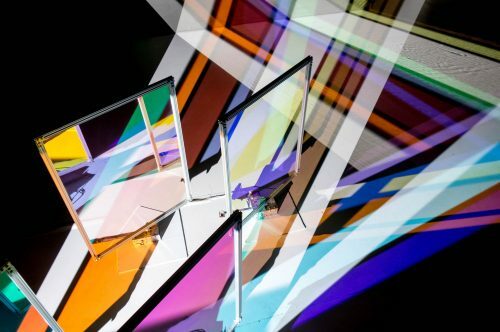 The featured projects address our attitudes towards both colours and towards all visible things too: they aim for playful discoveries of colour effects through delving into exploration of different meanings and human understanding of the colour spectrum, so they often create astounding and aesthetically pleasing ambiental effects. 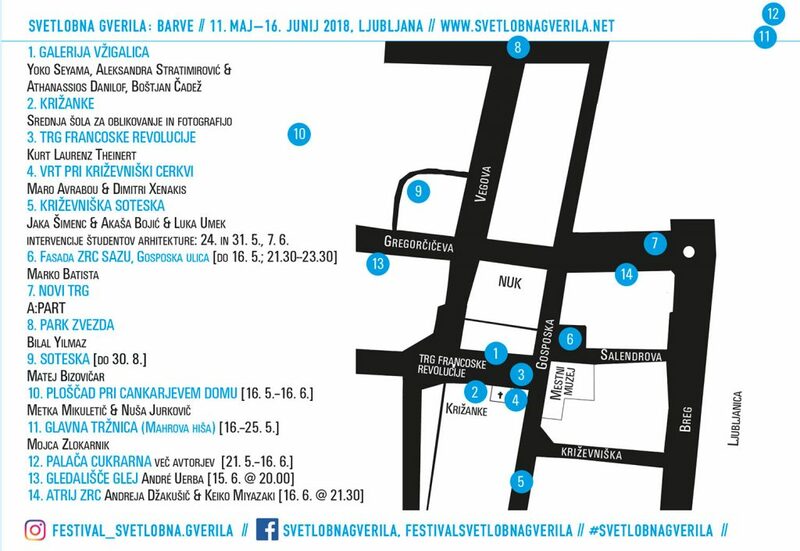 The festival again consists of two main parts: first is the opening of the festival with projects in the Vžigalica gallery and its surroundings, while the other is another series of events that takes place in the Cukrarna palace for the second time in a row. Apart from the festival events on the Museum Summer Night (16. 6. ), this year we’ll celebrate the first International Day of Light (16. 5.) as well. Just as in the past years, we’ve reached out to several educational institutions in Ljubljana and numerous individuals, partners and coproducers to prepare a workshop program for the Lighting Guerrilla Laboratory part of the festival this year too. One of the goals of the festival is, of course, to shape a different image of the city: by dressing it in vibrant colours we believe we’ll be able to create a memorable and exciting artistic intervention which will stimulate the imagination of the residents and visitors of Ljubljana yet again. Aleksandra Stratimirović (SE/RS) & Athanassios Danilof (GR), Yoko Seyama (DE/JP), Boštjan Čadež (SI), Kurt Laurenz Theinert (DE), Srednja šola za oblikovanje in fotografijo, Maro Avrabou & Dimitri Xenakis (FR), Jaka Šimenc & Akaša Bojić & Luka Umek (SI), Marko Batista (SI), Matej Bizovičar (SI), A:PART (SI), Bilal Yilmaz (TR), Metka Mikuletič & Nuša Jurkovič (SI), Mojca Zlokarnik (SI), Andreja Džakušič (SI) & Keiko Miyazaki (SI/JP), Marija Jenko (SI), Natan Esku (SI), Miran Kreš (SI), Natalija Črnčec & Nina Šulin (SI), Erik Mátrai (HU), Akademija za likovno umetnost in oblikovanje (SI), Fakulteta za arhitekturo, Tina Mozetič (SI), André Uerba (PT), udeleženci Laboratorija Svetlobne gverile: Marko Batista in Boštjan Čadež, Maja Bojanič in Tisa Neža Herlec, Brina Ivanetič in Eva Mlinarič, Neža Jurman, Žiga Palčar, Lina Rica, Matej Stupica, Špela Škulj, Staš Vrenko, MO:YA Visuals (AT) & Sašo Sedlaček, Damijan Kracina, Jaka Šimenc, Brane Ždralo, Luka Frelih (SI). In the photo: Yoko Seyama: Saiyah #2.